· 1 Free Low Level Light therapy device (HairMax® Laser Band or Theradome™) to stimulate hair growth. 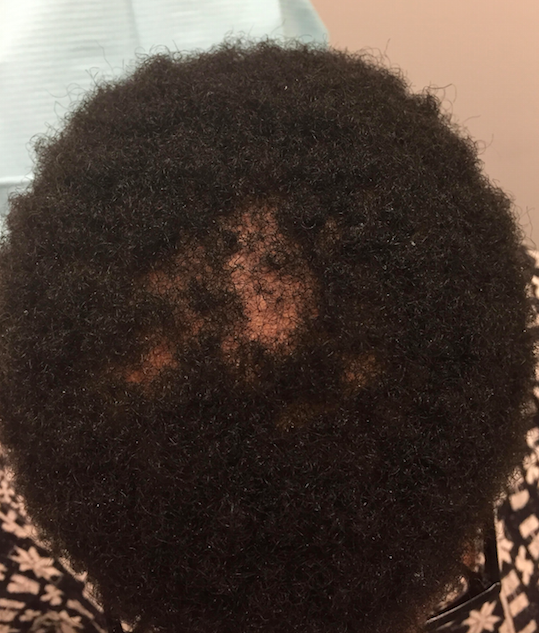 Central centrifugal cicatricial alopecia (CCCA) is a type of scarring hair loss seen most commonly in women of African decent. It can start as an area of breakage and or sensitivity in the central scalp and progress to irreversible hair loss and baldness. The exact cause of CCCA is unknown. Associated factors include genetic pre-disposition, tension producing hair-grooming practices, and intrinsic properties of the African hair and follicle, type 2 diabetes mellitus, chemical relaxers and fungal scalp infections. Many dermatologists report that CCCA is EPIDEMIC in women of color. Hair loss can have a negative effect self esteem, personal relationships, work relationships and can even be associated with depression. Given the large number of women affected by this condition, there are limited research funds allocated for CCCA research. A review of the literature demonstrates a severe paucity of studies investigating the risk factors, causes and treatments for CCCA. This is a call to ACTION!!! Lets all be a part of the solution. Lets help the many of women who suffer in silence with this condition and the doctors who are willing and committed to doing the research. We encourage all to donate to the Cicatricial Alopecia Research Foundation (CARF). Note that your donation to CARF is tax deductible. When making a donation to CARF, please mention that Osei-Tutu referred you. One grand prize winner will be chosen from a pool generous donators on December 31st. Donate more and increase your chances to win. Winners will have 6 months to redeem the prize.